Aging has it perks, but wrinkles are at the bottom of my list so I am fighting back! Lucky for me I have two pretty amazing estheticians that assist me and my issues. Mary and Jenelle give me advise and recommend the right products for “my problem areas”. They are skin superstars all the way around. Able to diagnose and pinpoint a solution every time. I need these girls in my life and I encourage you to see what they could do for you as well. So I want to share with you some top ingredients to look for in skin care products that will help EVERYTHING. And one of our products that has all these amazing ingredients in it, Anti Oxidant Infusion Creme. It is AMAZING and it works. I especially LOVE it because I am allergic to everything! And I am NOT allergic to this…happy dance. I don’t know anyone that has tried it and didn’t love it. It is one of those products that when you are getting to the bottom of the jar, you make sure to get another so you don’t run out. Next time I will share with you how I can’t live without Venom, a topical Botox! Ok so here is all the good stuff. Retinoic Acid (vitamin A) Topical vitamin A is shown to increase cellular turnover, so that dull surface cells are shed more rapidly. It thickens the epidermis, improves skin texture and elasticity and evens out skin tone. Retinoid products help your skin retain collagen, which is lost as we age – and more collagen means fewer wrinkles and dark spots. Retinoid products are derived from vitamin A and are available with a prescription or over the counter. They can dry the skin even as they encourage skin-cell renewal, so it makes sense to use a retinoid product with a moisturizer. Retinoids are well matched with nighttime moisturizers because sunlight can weaken retinoid effects. So why are there antioxidants in our skin care? Antioxidants plays a very important role in your skin care. You probably have noticed an overwhelming amount of products who advertise that they have antioxidants infused in them. One of the most important roles that an antioxidant plays is anti-inflammation or anti-inflammatory. Alpha Lipoic Acid is a great antioxidant that has shown impressive results with anti-inflammation. When we are not inflamed we have an even skin tone and our wrinkles are less noticeable. Sun damage can make skin appear tough with an erratic skin tone. We have found that Antioxidants stimulate blood flow in your skin. When that happens you have new cell formation, making your skin look younger and improving skin tone. Antioxidants such as vitamins C & E are also great at treating wrinkles. These vitamins increase the growth of your collagen. And we have seen that Coenzyme Q-10 or CoQ-10 helps firm or tighten the skin. So all of that so I can recommend what works and what our clients swear by and can’t live without now that they have found it. Our Anti Oxidant Infusion Crème. This is our number one selling product because of the unbelievable results you can achieve in a small amount of time and better results with extended use. With twice daily application you will see definitive results such as: Reduction of Fine Lines & Wrinkles, Improved Skin Tone & Texture, and an over-all improvement in skin health. 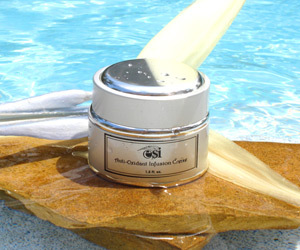 Anti-Oxidant Infusion Crème is one of the leading result producing anti-aging cremes available on the market. What sets this crème apart from all others is the proprietary blend of anti-oxidants and anti-aging active ingredients at their highest levels to ensure maximum results. Anti-Aging is definitely a science but it is not a mystery. Yes, you can reverse previous damage that is done by both intrinsic and extrinsic aging. The aging process is a culmination of many factors. We begin the true aging process in our late twenties so the earlier that you begin to care for your skin the younger you will look in the long run. Signs of aging in the twenties are minimal but when we hit our mid-thirties this is when we truly begin to see the hints of the aging process. The older we get, the rate of speed our bodies re-generate slows down. It produces less moisture, less collagen, and less elastin, which are the simple building blocks of our skin. The good news is we can combat these things by applying clinical products, and always wearing sunblock. The Anti Oxidant Infusion Crème is packed with several ingredients that are key to the anti-aging process such as the Algae Peptides, DMAE, Copper, Alpha Lipoic Acid, and Retinoic Acid. Here are the definitions of all those cool ingredients. Algae Peptides (Ahnfeltia Concinna 5%) contain the amino acid Hydroxyproline, which is the building block to collagen, so as you use this product it makes your skin grow its own collagen at a faster rate. This ingredient is key to battling both intrinsic and extrinsic aging. Copper: This ingredient stimulates enzymes to help build new elastin and collagen. Also aids in the production of Keratin in the epidermis, which leads to improved skin texture. DMAE (Dimethylaminoethynol): Ingredient that can help firm sagging skin by thickening the muscle mass. Alpha Lipoic Acid (Thiotic Acid) Ingredient that is 400x the strength of vitamin C, the particle of this anti-oxidant is small enough to penetrate to the mitochondria of the cell, protecting and reviving the center of the cell where the cell’s energy is produced. This is ingredient is key to improving skin texture and radiance. Retinoic Acid (vitamin A) Topical vitamin A is shown to increase cellular turnover, so that dull surface cells are shed more rapidly. It thickens the epidermis, improves skin texture and elasticity and evens out skin tone. We all look for the fountain of youth at some point in our lives. And along the way do our best to take care of our body so we don’t fall apart prematurely. But will we ever find that miracle cream that will keep our complexion looking younger than it is? I have found a few pretty amazing products over the years and today I will share one with you. I use products from 2 skincare lines, Glotherapeutics and Esthetic Skin Institute. Esthetic Skin Institute uses the highest quality and quantity of active ingredients allowed by law before having to see a dermatologist. My favorite product from Esthetic Skin Institute is Venom. It is a wrinkle anti-dote and topical Botox that can decrease the depth of your wrinkles by 65%. Results can vary and the product should be applied twice a day and the first thing your put on your skin in your skincare routine. The active ingredient in Venom is Syn-ake, a Dipeptide that mimics the paralytic effect of snake venom. It also contains Natriance that will reduce wrinkle depth and length. Liftonin Xpress provides a physical tightening effect which is intense, immediately noticeable and lasts for several hours. And Blue Algae Extract is a natural retinoid alternative without the unwanted side effects. I have been very happy with what it does for my skin. It is expensive but it works. For 1.25oz the cost is $160 and will last a little over a month, the .65oz is $110. You can make it last longer by using it only on the areas that drive you crazy or only using it in the morning. We have put the products on special this month. You can order from the website and get 20% off. When you order from the website it will take about 10 days to get your products because we might have to order from the manufacturer and then ship them to you. So you can decide what is best for you and your complexion. I highly recommend the Venom and other products from Esthetic Skin Institute. Browse our site to see what other products you can add to your skincare routine to minimize your aging process. I own Voilà Salon & Spa and I love my career! I serve people…I love to help people look and feel their best…I feel proud, happy, productive and accomplished everyday! But my family and my faith are what complete me. I am the author of Shear Savvy Secrets & Strategies for Successful Salon Apprenticeships and creator of The Meticulous Manicurist YouTube channel. I highly recommend using Tube Buddy for your YouTube channel to help your videos climb to the top of recommended videos. There is a free version but I use the Legend version so I can translate my videos in any language I want! 250K Subscriber Giveaway Enter to Win!